His Imperial Majesty King Roman the First proclaims, from this day forth, that the Grand Duchy of Lithuania shall be again the Kingdom of Lithuania, and that the Kingdom of Lithuania, including Belarus and Ukraine as originally, with the Grand Duchy of Latvia and the Grand Duchy of Moldova, shall henceforth together constitute the Empire of Europa. Decreed and proclaimed this 7th day of March, 2005. Under International Law, a de facto or de jure Royal Sovereign has four Sovereign Entitlements: 1. Sovereign Equality; 2. Sovereign Precedence; 3. Sovereign Privileges; 4. Sovereign Immunity. 1. Sovereign Equality originated in the 1648 Treaty of Westphalia - for example, the Prince of Monaco, Queen of England, King of Lithuania, Emperor of Japan, and Emperor of Europa, have equal sovereignty. 3. Sovereign Privileges are various, and include making decrees and proclamations, and invitation to appropriate royal, government, and charity, events. 4. Sovereign Immunity is similar to diplomatic immunity but stronger by precedence. Roman Emil Dambski, Count of Lubraniec, married Princess Paulina Irma Gedroyc in 1927 at Lwow and became Prince Roman 1. Princess Paulina was declared dead from 1940-1946, during which period Prince Ronald (1942) and his sister Princess Christine (1945) were born. Ronald Victor Charles Mann was Prince Ronald upon birth to Lady Katherine Mann and Prince Roman Emil 1, Count of Lubraniec Dambski, in 1942. Prince Roman 1 may already have been a Prince by Dambski of Lubraniec marriages into Radziwill and other Royal Families. Prince Roman 1 became Grand Prince of Lithuania in 1943 on the death of Grand Prince Wladislaw Ignacy Marek Gedroyc. Prince Ronald became Grand Prince of Lithuania in 1967 on the death of Grand Prince Roman 1, then became self-crowned King of Lithuania in 2004 and Emperor of Europa in 2005. 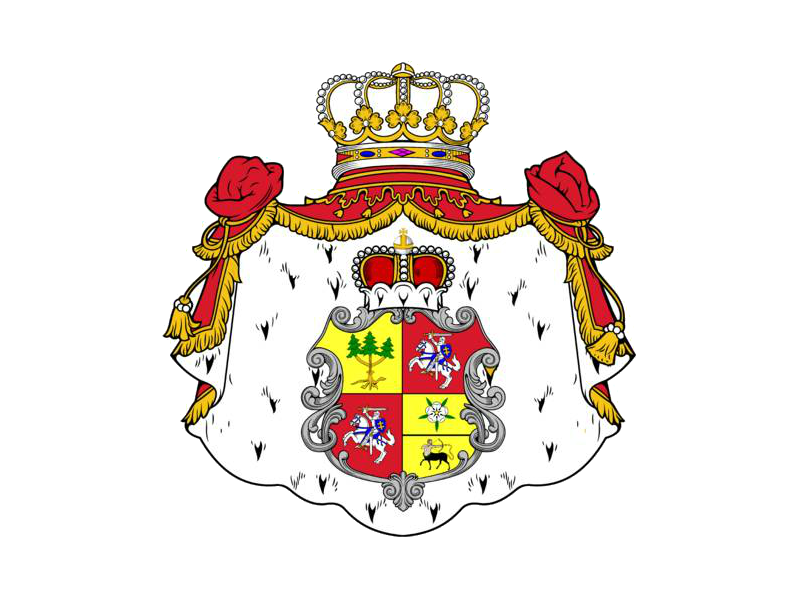 The Grand Duchy of Lithuania was usurped from His Imperial Majesty King Roman 1 in 1991, for which he seeks recognition, restoration of his territories, peoples, and sovereign entitlements, and restitution for deprival of these territories, peoples, & entitlements from 1991 to the present. This includes recognition from Britain, Australia, and the Northern Territory governments. His Imperial Majesty King Roman the First of the Empire of Europa proclaims that, from this day forth, Lithuania, Belarus, Ukraine, Latvia, and Moldova, shall be Grand Principalities, and that their capitals Vilnius, Minsk, Kiev, Riga, and Chisinau, shall be Sovereign Principalities whose Sovereign Princes shall be appointed by His Imperial Majesty and shall be his Imperial Majesty's deputies. Decreed and proclaimed this 30th day of June, 2018.